Sarah Knox has been with the Napa Valley Unified School District for thirteen years, serving in various capacities as English teacher and literacy coach at Napa High School, district instructional coach for intensive reading interventions (READ 180 and System 44), assistant principal at both non-Title I (Canyon Oaks) and Title I (McPherson) elementary schools, and most recently, as part of the district Instructional Division team in the role of Supervisor, Interventions. She has served on the Napa Valley Educator's executive board and as a site representative and currently site on the Association of Napa County Administrators leadership board. 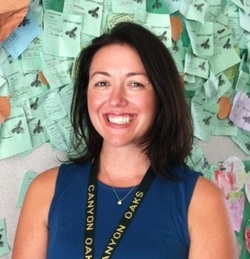 Sarah has also facilitated a wide range of professional development on behalf of the NVUSD and NCOE as a BTSA trainer, for BEST/PBIS, English 3D and the Teach Like a Champion series. Sarah was thrilled to join the second cohort of the Touro University Innovative Learning Masters Program and immerse herself in the latest cutting edge research and practices related to 21st century teaching and learning. As a member of the NVUSD, a close partner with NapaLearns and a leader of new technologies for learning, she felt compelled to learn all that she could in order to best support her teachers and students who are paving the way for career and college-readiness in the 21st century. More than anything, this project has helped me develop my leadership skills around reconciling my drive to implement and thorough attention to detail with my desire to innovate. At the outset, it seemed as though this was a straightforward project. My district was moving toward inquiry-based learning. I am a "show me the money" kind of person. It made sense to focus my efforts around designing and evaluating rubrics that would measure student progress within PBL units. I quickly learned that this was much easier said than done. I was trying to execute technical change (rubrics for assessing critical thinking) without considering or paying heed to the prerequisite adaptive change that would have to occur within the hearts and minds of teachers. 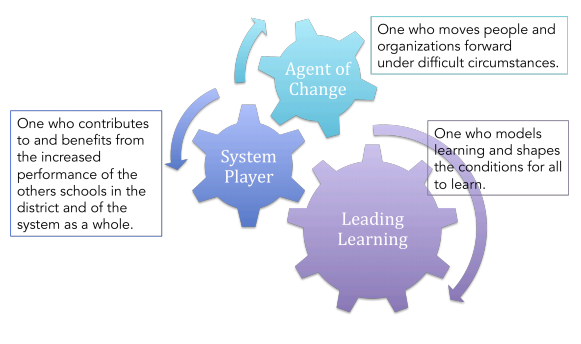 In order for our district to move forward with system-wide inquiry-based learning and increased integration of technology and 21st century skills, we need to first get some clarity around what the foundations of teaching & learning look like in our district. From there, we could then develop a cohesive framework for inquiry-based learning. In addition to the intense networking and planning that took place to get to consensus around these elements: the foundations of teaching & learning and a framework for inquiry-based learning within our district, it also became clear that we needed to develop a clearly articulated and widely held and understood point of view on what high quality integration of 21st century skills and the 4 C's looked like. This proved the greatest challenge of all and one that continues to be debated. An exercise which tasked small groups with developing definitions of critical thinking perfectly illustrates the difficulty inherent in this work. Some definitions were short, some long, some focused on student behaviors, others on teacher behaviors. If we couldn't agree on what critical thinking looked like, how were we going to be able to agree on ways to assess it? In the end, I feel that my project, while noble in its pursuits, was perhaps too broad in its scope and overly reliant on district and school level structures being in place that just weren't quite there yet. That said, I feel that the ball is now rolling with regard to the important issue of assessment within an inquiry-based model, and I have high hopes for where we as a district are headed in this regard. "A high school diploma is no longer a reliable ticket to a decent living. In an era of computers and instant access to information, problem-solving teamwork, and communication skills are essential for personal success." The principal's new role is to lead the school’s teachers in a process of learning to improve their teaching, while learning alongside them about what works and what doesn’t. It is not enough to employ the surface features or instructional tools that give the appearance of an inquiry-based classroom. One essential learning that I will take away from this Innovative Learning program is how important it is for administrators to view TPACK and the 4 C's through the lens of what teachers are being asked to do. Innovative learning is taking place all over our educational landscape. I've witnessed it firsthand in Napa Valley Unified's schools everywhere from twelfth grade Advanced Placement physics classes to sixth grade ELA classes and, most remarkably, within dual immersion kindergarten classrooms. There are pockets of excellence throughout our schools, and the students in those classes and schools are lucky to be in those environments. My concern lies with the students languishing outside those pockets...the children who are waiting to learn. If all truly means all, then we as leaders must take up the challenge of bringing those pockets of excellence "to scale" as Ellmore describes in Instructional Rounds. It is easy for leaders and coaches to point to rubrics and outcomes and tell teachers to go forth and implement. However, unless we as leaders truly understand the research behind changing instructional practices and appropriate instructional uses of technology, we will fall terribly short of our goal of educating all students to high levels and preparing them for college and career.